Our philosophy at Tranquility is to keep all our prices as low as possible, in order to save you money, without ever sacrificing quality, professionalism and dignity. It’s that simple. You see, we have a different philosophy than many other funeral service establishments. We keep the mark up on funeral caskets very low. Most of the caskets we offer you are priced under $2000, and they start at less than $500. This is much lower than the prices you will be quoted at most other funeral homes. 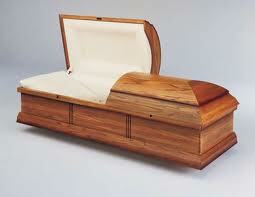 Even simple, affordable caskets can be dignified and attractive, perhaps crafted with veneer that looks like real wood. Naturally, we can also provide you with more elaborate and expensive selections, if you wish. The choice is yours. Our casket prices are so low that many individuals purchase caskets from us, even if another funeral home will be taking care of all their other needs. That’s fine with us at Tranquility. We’re here to make your life easier during a difficult time, in which financial concerns are both very real yet remain a sensitive topic for discussion.